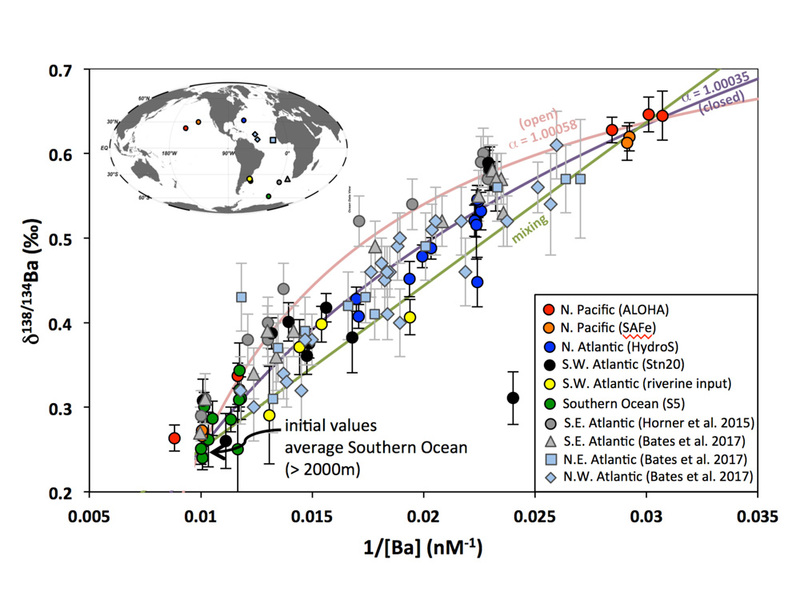 Hsieh and Henderson (2017, see reference below) propose a compilation of the oceanic barium (Ba) concentrations together with its isotopic profiles measured so far. Their review covers the main oceanic basins, comparing data obtained in the North and South Atlantic, North Pacific and the Southern Oceans. Their main conclusions are: near-surface Ba isotope values are controlled by basin-scale balances rather than by regional or short-term processes; isotope Ba fractionation during its removal from the surface is significant: the global Ba isotope data can be fit by mixing and removal/addition of Ba with a single isotope fractionation of 1.00058 ±0.00010; the resulting Ba isotope composition of the upper ocean waters is correlated with the fraction of Ba utilization at the basin scale; in the deep waters, it is suspected that external inputs of Ba (released by sediments or hydrothermal sources) can be traced by their specific isotopic signatures. Figure: Seawater Ba isotope compositions versus 1/[Ba] in the global ocean. The data are fitted with three curves generated by a steady-state (open) model, a Rayleigh fractionation (closed) model and a mixing model, each constrained using an initial composition equal to the average value in the deep Southern Ocean and a final value equal to the surface values in the Pacific Ocean. The results show that seawater Ba isotope compositions are controlled by basin-scale Ba utilization, remineralisation, and ocean mixing during the internal oceanic Ba cycle. External Ba inputs also play important roles in the oceanic Ba isotope budget. For example, riverine input introduces light Ba isotopic signatures to the surface ocean; and sediment or hydrothermal inputs may introduce heavy Ba isotopic compositions to the deep water, which have been identified with the non-conservative behaviour of Ba isotopes during the N-S Atlantic deep water mixing. Such distinct Ba isotope signatures from these sources can become useful tracers for constraining Ba inputs in the present and past ocean. Click here to view the figure larger.